Winning Wednesday – What Difference Do It Make? During November, I gave away a copy of the Same Kind of Different As Me: A Modern-Day Slave, an International Art Dealer and the Unlikely Woman Who Bound Them Together by Ron Hall, Denver Moore and Lynn Vincent. This was a book I couldn’t put down once I started it, so when I saw they had written a second book, I wanted to read it also. I read it, liked it and want one of my readers to be able to enjoy it also. Whether you’ve read their first book or not, you will enjoy this book. 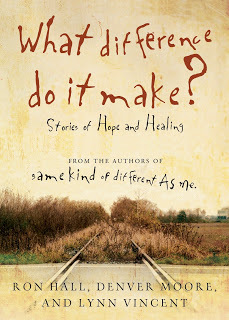 It’s filled with new, stand-alone true stories of hope and healing – some of the stories are the authors and some are sent in by readers of Same Kind of Difference as Me. Reading about the love these two men have for each other and for God is a joy. And seeing the difference they make to people around them gives me hope and confidence that I can make a difference in this world also. It’s an easy read, but packed with wisdom and encouragement. I like this man and his logic. Leave your name for a chance to win this hardcover book. ← Question: Why – Ducks and Coats? Sounds like an interesting read.. I wouldn't mind winning this one! Just got Same Kind of Different as Me yesterday. It would certainly be fun to read this as well. Thank you for your blog and GREAT inspiring giveaways! was so glad to see you featured at Glynn's today … keep on running the race!